The Art Gallery is fortunate in being able to display a number of items loaned by private individuals. These both complement existing collections and fill obvious gaps. By their temporary nature they can also add something new to a long-term display. 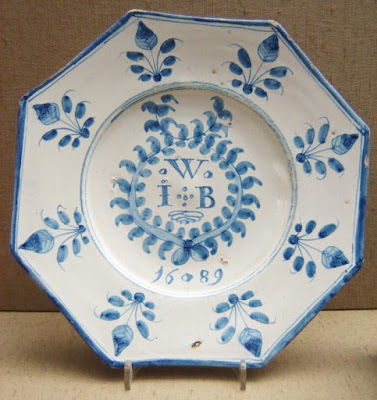 Although the gallery no longer recognises ‘permanent’ loans, some do go back a very long way (the ‘oldest’ loan dates back to 1929) and have almost become permanent fixtures, so it came as a bit of a shock when a lender of an important delftware plate made in Brislington and dated 1689, informed the gallery that he wished to sell it. Brislington was the earliest of the delftware potteries in the Bristol area and dated examples are particularly rare. This plate is one of a group of fewer than ten known similar octagonal plates which share various motifs: a triangle of varying initials with a date and the distinctive plant motif with pointed bud. They bear dates between 1685 and 1691. Brislington is probably best known for its impressive large dishes bearing Royal portraits and we have examples of these but this simpler style of plate is rarer. In the circumstances BMAG decided they had to attempt to acquire the plate. First port-of-call were the Friends of Bristol Art Gallery. In order for museums and galleries to attract national grants, they have to be able to show local support for an acquisition. The Friends were delighted to offer £2,000 at our October (2016) meeting, allowing BMAG to approach the Arts Council England/Victoria & Albert Museum’s Purchase Grant Fund for 50% and then The Art Fund for the final £2,000. Shortly before Christmas the full amount had been raised and the purchase was completed in early January. The plate had been on loan, and on display, since 1973 so it doesn’t seem much like a new acquisition but it is good to know that its future within the Museum & Art Gallery’s collections is now secure.